Published Oct 1, 2014 by Pearson IT Certification. Part of the LiveLessons series. Red Hat Certified System Administrator (RHCSA) Complete Video Course contains more than 12 hours of training with content divided into 4 modules with 26 video lessons. The videos consist of live trainer discussions, CLI presentations, live demos, and practice exam exercise walk-throughs. 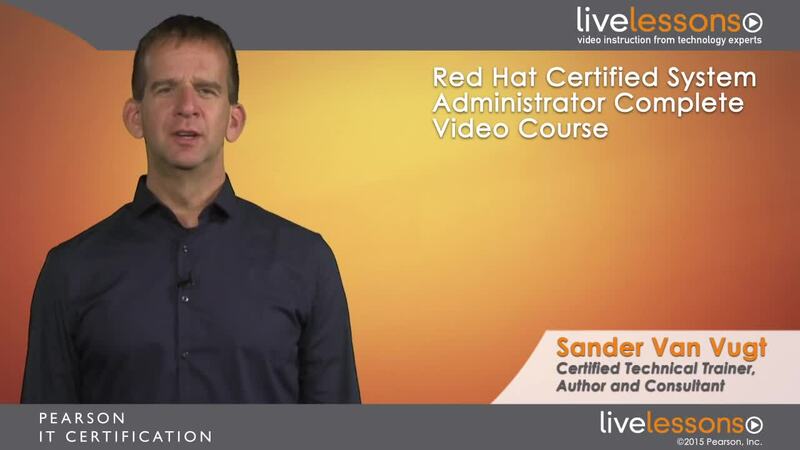 The video lessons in this course review each exam objective so you can use this course as a complete study tool for taking the Red Hat Certified System Administrator (RHCSA) Complete Video Course. Instruction throughout offers detailed explanations, demos, tips, and more. This Complete Video Course includes interactive hands-on exercises for each lesson with thorough video explanations. The streaming site also includes module quizzes and exercises so you can test your knowledge every step of the way. This session introduces the course and explains what students can expect of it. This session explains what participants can expect on the RHCSA exam. This session explains how participants can set up an environment in which they can do hands-on practice. In this lesson, the participant learns how to install Red Hat Enterprise Linux Server. In this important lesson the student sets up the environment he can use for further practice during the rest of this course. This lesson revises basic shell skills, such as editing text files, using commands, and finding help. It also discusses input/output redirection. This lesson revises how to use essential file management tools that enable administrators to list, copy, move, and delete files and to create hard and symbolic links. It also discusses how to compress and archive files and how to find files. In this lesson, the student learns how to process text files. Regular expressions as well as common tools such as grep, cut, and tail, are discussed. This lesson teaches how to connect to a RHEL Server. It includes local connection methods such as virtual consoles, but also discusses how to connect to a server using SSH and VNC. In this lesson, the student learns how to create and manage user and group accounts. It also covers authentication against an LDAP Directory server. In this lesson, students learn how to connect Red Hat Enterprise Server to an LDAP Server to handle authentication. This lesson teaches how to manage file permissions and Access Control Lists. This lesson discusses how to set up networking on Red Hat Enterprise Linux. This lesson shows how tasks and processes are managed. It explains how to interpret information from the top utility and shows how to terminate processes and change process priority. This lesson explains how to install and manage software. It explains how to refer to repositories and how to use the yum tool to install software from the repositories. It also teaches how to perform queries on installed software using the rpm tool. This lesson explains how to work with virtual machines in a KVM environment. It explains how to use the role of libvirt, and how to work with the virsh and virt-manager tools. In this lesson, the student learns how to use Cron and atd to schedule a task for regular execution, or one-time-only execution at a specific time. This lesson shows how to configure an rsyslog server for local log handling. In this lesson, the student learns how to organize storage. Creation of partitions is covered, as well as formatting these partitions with the XFS or ext4 file systems. This lesson explains how to work with logical volumes. It explains how to set up a server with logical volumes. This lesson discusses how to perform basic kernel management tasks. It discusses how to update the kernel and how kernel modules are used to manage hardware on a server system. This lesson discusses how to use Kickstart for an automated installation of Red Hat Enterprise Linux. This lesson discusses the boot procedure from the Grub2 boot loader up to starting services with systemd. This lesson explains how to resolve common problems that can occur during the boot procedure. This lesson discusses how to set up a basic HTTP server. This lesson discusses how SELinux is used to protect services on a Red Hat Enterprise Linux Server. It introduces some of the most common SELinux management tasks and explains how to deal with common SELinux-related problems. This lesson explains how to use system-config-firewall to set up a firewall. In this lesson, students learn how to set up an FTP service for anonymous file downloads. In this lesson, the participant learns how to set up the NTP service to get time from an NTP server. In this lesson, students learn how to configure Red Hat Enterprise Linux for VNC access. This includes the configuration of a VNC Server as well as connecting RHEL 7 to an external VNC Server.